It has been a long time since I have given much thought to the mechanics of how we “organize",” or keep track of, the garden here at Juniper Hill so I thought I would do a quick walk through for folks who might want to adopt a system similar to ours. I’m not really sure if this is a true potting shed or simply a gorgeous little shed/outbuilding. It sits at the very end of a long axis in the garden at Rodmarton Manor, one of the last untouched arts & crafts manor houses and gardens in England. I have always loved the way the two yew hedges flanking it have been carved out to accept the edges of the roofline. This Japanese Maple at Sezincote, in Gloucestershire, England was on its last legs but the collection of moss on its trunk and the surrounding plantings made for a lovely vignette. Allium ‘Purple Sensation’ pokes its head up through the hostas. The Robinson crabapples are strutting their stuff at the east entrance to the garden. The line of four crabapples separate the entry path and the wildflower meadow to the left. 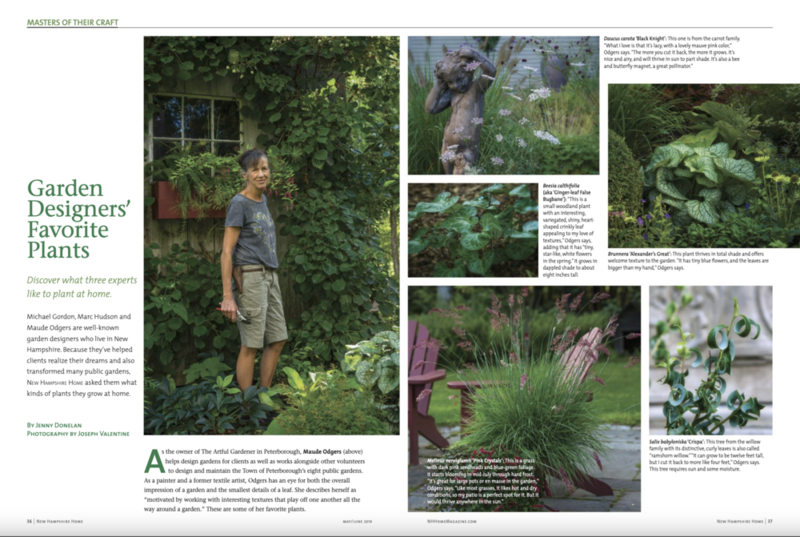 You can visit Gordon and Mary Hayward's amazing garden in Vermont when it opens for The Garden Conservancy on June 17th. Gordon Hayward will also be leading a design workshop in the garden that day. Click here for details. With its beautiful purple flowers and hairy flower stems, Pulsatilla vulgaris is one of my favorite springtime flowers. Equally attractive are the plume-like seed heads that follow the flower. It's always a sign of good things to come when I see Bloodroot (Sanguinaria canadensis) poking through the leaf litter. Click on the above image to see the entire issue! Thanks, New Hampshire Home Magazine! It was so much fun collaborating once again with Andi Axman, John Hession, and the team at New Hampshire Home Magazine on their latest issue. We already had a fair amount of snow on the ground here at Juniper Hill even before they predicted yesterday's "bomb cyclone." I think just naming the storm a "bomb cyclone" scared a lot of people into thinking that this was going to be something more than just a good ol' fashion noreaster. It wasn't. It was great fun working with writer Roberta Hershon and the team at Design New England Magazine on the feature on Juniper Hill that just appeared in their January/February issue. The magazine is available on newsstands now or you can check out an on-line version below. Thanks, Design New England! I'm just loving all the interesting forms and textures in the November garden like these Monarda seed heads, especially when they are accompanied by some of the finer, more frillery grasses. Gone are all the bright colors of summer, now replaced by the more subtle browns and beiges so characteristic of this month.